To all of you amazing artists out there, I am trying to find some research on mold making on a large scale. I am making a merman tail as part of my major project at uni, we are using fibreglass for the internal core, I am now currently sculpting on this. I am having difficulty in finding research on mold making on a large scale, especially to do with injection holes. This project is just over 6ft tall, I was going to do this with foam latex to keep costs down (however time wise and the small oven size that uni have, I am having to use silicon). Any advice on what books are out there on this or video's that will help with my research would be greatly appreciated. I don't know of any good/recent books on making large scale molds, but you are on the right track with choosing fiberglass. Where you place your injection holes for silicone depends a lot on the shape of the object you molded, and how the mold is constructed. You want to allow the silicone free access to all areas of the mold without trapping air. You'll also want small bleader holes throughout the mold that allow air to escape. You can fill those with clay or screws as the mold fills and silicone starts to bleed out of the holes. Using screws to plug bleader holes for a large mold is a good idea, as the pressure from all the silicone above the bleader will be pushing out fairly hard. You can even put a bit of hot glue on the screw as a safety measure. The last thing you want is to have all your expensive silicone leak out onto the floor. It's also a good idea on large molds to add a bit of support to the fiberglass to prevent it from bending/flopping around. This can be as simple as embedding wood, or by designing the structure of the mold to help prevent flexion. 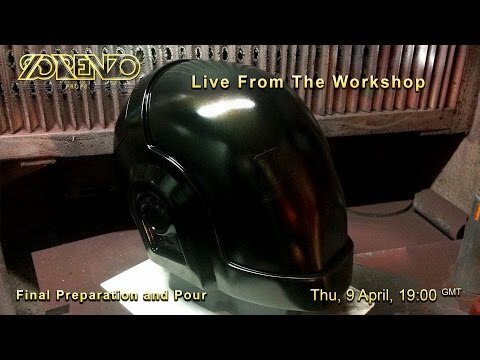 Here is a video that shows a prop maker casting silicone in a matrix mold that has bleader holes.